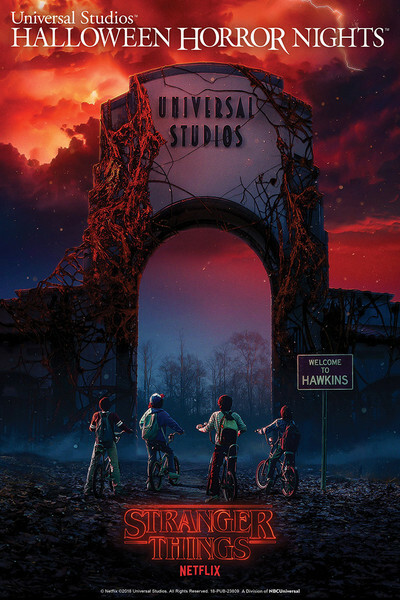 Hold on to your bicycles horror fans, Universal have just announced that Strangers Things will be coming to this year's Halloween Horror Nights. Season one of the hit Netflix show will feature as one of Universal's famous mazes in their Orlando, Hollywood and Singapore parks. Universal are working closely with Netflix to create a house that will immerse you right into the show. Just like Will you will begin your journey on Mirkwood, then swiftly you will enter the Hawkins National Laboratory where things aren't quite as they seem. Expect to journey to the home of the Byers, with its Christmas lights covered walls that Joyce uses to communicate with her missing son. You will also enter "the mysterious darkness of the Upside Down more than once - whether you like it or not". All of this whilst being hunted down by the fearsome Demogorgon. Experience all the memorable events and see some of your favourite characters from the smash-hit first series from the cult show. Who else is hoping for the return of Barb and perhaps Steve and his baseball bat? Fans of Halloween Horror Nights have been vocal about their desire to see Stranger Things make an appearance at Halloween Horror Nights and now they finally have their wish. Lets just hope we have enough Eggos waiting for us at the end of this maze, we're going to need a calming snack! Stranger Things is just the first maze to be announced for this year's Halloween Horror Nights events. At Universal Orlando this year there are set to be 9 haunted houses as well as terrifying scare zones and live shows to enjoy.